It’s now five weeks since Evan had his bone marrow transplant. So far there have been no host-versus-graft symptoms, with the only problems being fevers. Today was the six month anniversary of Evan being re-admitted to hospital following his leukaemia relapse. The nurse said he now holds the record for the most number of files in the hematology ward. 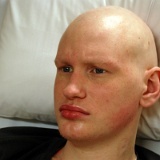 Evan recovering three weeks after the bone marrow transplant. angeles-hill.com | Powered by Mantra & WordPress.